Hands-on associates | What’s new? IAM RoadSmart Solent’s new identifier, which represents the varied types of members and the group’s long association with The Solent. 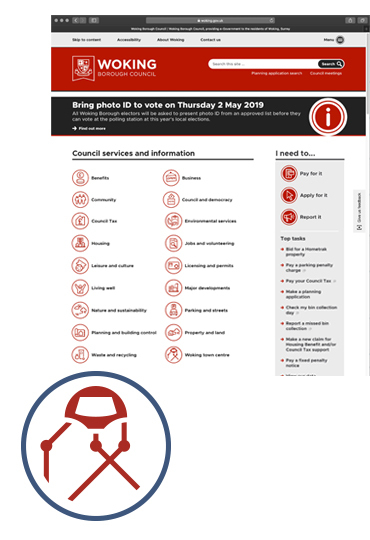 Symbols for Woking Borough Council’s new web site, including a rendering of a local landmark, HG Wells’ Martian. Bahnstormer Motorrad asked for a mark to distinguish their ‘Edition’ motorcycles: customised with parts, accessories, or paintwork. We developed a simple addition to their current identifier: suitably minimal, it allows the bikes to speak for themselves. We’ve helped out a friend of ours with an illustrated childrens’ story book: I Saw It First … in Salcombe. Something of a departure from our usual line of work, it’s a fundraising effort, with a percentatge of the profits going to the RNLI. We have recently deliverd the maps for a web-based interactive booking system for a Surrey food and drink festival, and a set of symbols for Woking Borough Council’s new web site. A new identity and associated information collateral for IAM RoadSmart Solent, a Hampshire-based road safety organisation, were launched in 2018. We have been working with a German client to deliver an information and promotion campaign for on-line language courses, delivering content in English, German, and Russian. We are working with a new client operating in the catering consultancy and design sector. Design proposals for a new web site have been submitted. We are in the midst of a medium-term project for the financial services division of Wolters Kluwer, a global information services company. The work involves the review and updating of a range of information products, including software architecture and process diagrams.